A personalized product recommendation isn’t a gut feeling; it combines multiple sources of data like customer purchase behavior, interests, hobbies, view history, activities on social media etc. The recommendations also take into account the customer similarities, and other customers’ behaviours, too to offer targeted and related products/services. As the competition is tough, not only is catching the attention of customers a challenge; but it is also another challenge to keep them interested and make them feel your site/shop/products are created just for them. Brands are expected to deliver interesting, rich and targeted customer experience with personalized product recommendations across every touch point, for greater sales and brand loyalty. When you look up for `personalized product recommendations’ in a dictionary, they should show you Amazon as the definition. They receive a remarkable percentage of their revenue (as a matter of fact 35%) from implementing product recommendations into nearly every part of the purchasing process. Amazon has billions of data points to track various behaviours and it is able to test quickly whether the recommendations are successful or not. Amazon uses customer behavior such as purchase history, products in the shopping cart, cart abandonment history, wish list, product ratings/likes, and blend with other users’ behaviours and preferences. In addition to that, success also lies on implementing automatically generated recommendations in locations where customers are most likely to respond. This may be on product pages, in the shopping cart, or on special sale and category pages. c. They also show you best sellers and recommendations for you in some categories on the home page. When you are on a product detail page, Amazon uses cross-selling method by suggesting supplementary products/accessories based on the product that you have opted to purchase. For example if you are buying a cosmetics product (below), they show you other products to be used with, to `complete the look’. Aren’t you still adding anything to your basket? Maybe you can also take a look at the products that are viewed by the other customers who also viewed your item (below). Amazon shows a similar suggestion method when you purchase an item (customers who bought this item also bought). They predict that you would enjoy those items since other customers bought them together. Amazon’s recommendations have a huge impact on users’ shopping behaviours. They act like a personal assistant by reminding a customer of essential accessories and “read the customers’ minds” about what they need to buy next. As a result, these proven reccomendation methods are used by most of the e-commerce sites. The biggest on-demand video streaming service, has not only been one of the earliest and successful adopters of personalized product recommendation, they utilize Big Data to create shows that their users will like. 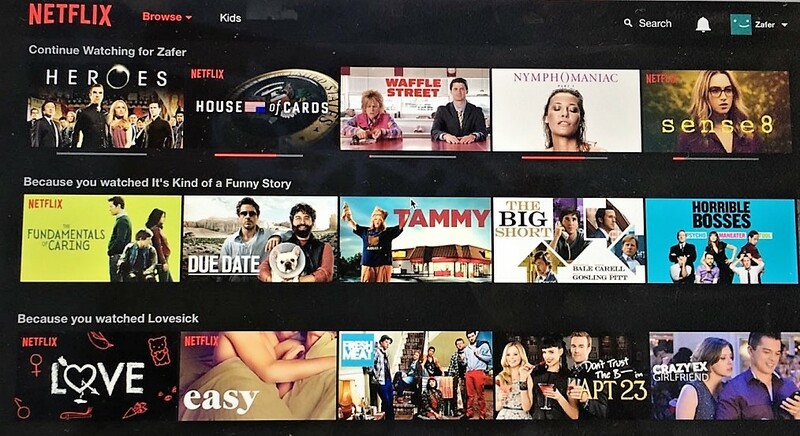 Netflix algorithms ensure the content displayed on the homepage of a user is based on user’s genre preferences, ratings, recently viewed content, feedback and other interactions, or feedback taken from various user surveys directly. Netflix says that they adapted their personalization algorithms in such a way that now 75% of what people watch is as a result of recommendations. However, the common product recommendation use was not enough for Netflix. They cranked it up a notch by creating the U.S version of TV series House of Cards by analyzing the users’ insights (directed by David Fincher, starring Kevin Spacey – very liked director and actor- and based on a British series – also a popular demand) which succeeded with a rating of 9/10 in IMDB. So we can easily say that having such a powerful recommendation engine and user insights guarantees a constant increase in the amount of time users spend streaming content on Netflix. Business and employment-oriented networking site, performs recommendations based on jobs you might be interested in, companies/groups you might want to follow, and people you might know. With over 450 million users, it also has features like ‘recommend’ that allow users to recommend their 1st degree connections and ‘ask for recommendations’ to request recommendations from their first degree connections. 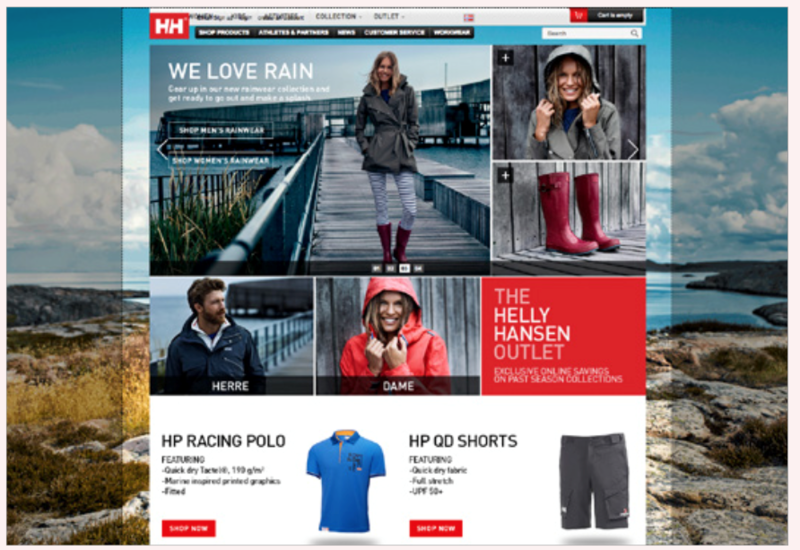 Helly Hansen is a sportswear brand for sailing, watersport, skiing and rainwear products. They have an interesting approach on product recommendations based on geotargeting by pairing weather forecasts with their suggestions. So if there is a one week of rain forecast in Germany for example, their homepage shows rain gear. Owing to these suggestions, they achieved 170% conversion rate and 52% conversion rate among new visitors. DXX which sells extra-large men’s apparel, also uses product recommendations in a less-usual way. They provide an in-store experience for their customers by using online fitting and finding tools. 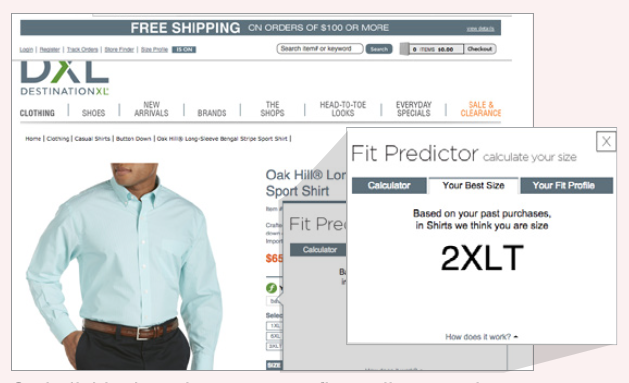 In basic terms, a customer only sees the products that fit his size (unless he turns off the feature from the settings) by using a fit predictor engine. Needless to say, other big players like Google, Facebook, Twitter, Hulu, Spotify etc. are also incorporating Personalized Product Recommendations as a standard element. As we have already seen from the proven facts on use cases, there are countless benefits of personalized product recommendations. Gaining Insight on Customer Behaviour and Preferences: As personalized recommendations are based on user behavior like purchases, page views, and items purchased/viewed together, they give you a deeper insight of real customers’ preferences and product matches which you might not have considered before. Better User Experience: Showing users personalized and relevant products saves them from the `hassle’ of searching and exploring your site and enables them to see what they need with ease. Maximizing Sales: Personalized Recommendations can have a big impact on what gets added to the cart. Combined with cross-selling and up-selling methods, it increases Average Order Value and Number of Items per Order. In simple words, when customers are offered related products, they are more likely to add items to their purchase. A MarketingSherpa survey also determines that the worldwide average of website revenues generated from product recommendations is 12%. Converting ‘Browsers’ to ‘Customers’: Personalized Product Recommendations decreases the ratio of customers leaving the sites without purchasing anything by constantly offering them related products. Supporting with personalized e-mailing/ marketing, this also increases customer retention and conversion rates for future purchases. As the benefits of integrating recommendation system into a business are already proven by the big players, product recommendation engines are growing in popularity amongst SMEs, too. Recommendation systems are one of the most powerful strategies enabling companies to provide more sophisticated customer service and a strong advantage over the competition. That’s a great article, Asena! I just recently came across an online retailer offering great product recommendation tool to help their shoppers choose the perfect bike https://www.raleigh.co.uk/bike-finder. A few simple questions, beautiful images, and customized results - really liked their personalized approach!